Raise a frosty pint glass in the air on Saturday, Dec. 10 and toast to National Lager Day! The popularity of craft beer has exploded across the country in recent years. In Arizona, the trend is widespread, much to the benefit of beer aficionados across the state. The demand has not gone unnoticed by retailers and restaurants across the Valley. From local breweries popping up on every corner to grocers including Whole Foods, which carries an extensive selection of craft beers from local and national brewers, businesses are eager to satisfy customers’ thirst for specialty beer. 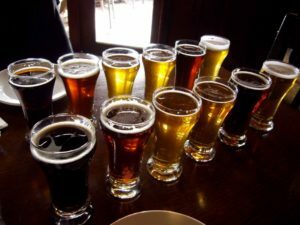 Saturday, Dec. 10 is National Lager Day and – lucky for us – several Chamber members have answered the call to provide a wide array of craft beer options not only Dec. 10, but every other day of the year as well. Whole Foods responded to the demand for craft beers in Arizona when it opened its store on 20th Street near Highland, which features a fully functioning tavern right inside the store. 20 Highland Tavern invites guests to enjoy 36 rotating beer taps and a full menu including sandwiches, hand-tossed pizza, sushi and much more. Head to downtown Phoenix to The Arrogant Butcher, one of Fox Restaurant Concepts’ most iconic restaurants. The 2015’s Opentable Diner’s Choice winner’s food and beer selection will satisfy anyone looking to enjoy upscale new American comfort food paired with local beer from Four Peaks, San Tan Brewing Co. and Huss Brewing. An ice-cold beer is never far from your door step. Gordon Biersch Brewing Company beckons beer lovers with multiple Arizona locations featuring original lager recipes crafted using the highest quality ingredients. From GB’s light and refreshing Golden Export lager to the deliciously dark Schwarzbier lager, with a dry, roasted coffee finish, there’s a taste for everyone to enjoy. Not to be left out, even Fry’s Food Stores “Marketplace” stores include a walk in and take-a-seat bar featuring wine and craft beer fresh from the tap served by a knowledgeable wine steward. If you don’t have time sit and enjoy a cold one in-store, Fry’s offers a large range of single-bottle craft and international beers to allow you to create your own unique 6-pack to explore new beer styles while also enjoying your favorites. Seasons 52 is known for its seasonally inspired menu featuring ingredients at the peak of freshness. The rule of freshness not only applies to its food, but also translates to its expansive bar menu featuring some of the world’s most popular beers. Don’t forget to stop by one of these trail-blazing locations on Dec. 10 to raise a frosty pint glass in the air and toast to National Lager Day!